By Heidi J. Pollard, RN, MSN and C. Alec Pollard, Ph.D. Families also have to contend with psychological obstacles. In a prior issue of this newsletter, we discussed how fears about the recovery process and competing incentives lead some OCD sufferers to avoid dealing with their disorder constructively. We called this failure to pursue help “recovery avoidance.” Other family members may grapple with recovery avoidance as well. A husband may avoid therapy because he mistakenly believes the therapist will blame him for his wife’s problems or parents may not want to deal with the anger their son might exhibit if they seek help. An individual’s assessment of the costs (e.g., danger) and benefits (e.g., incentives) of seeking help are influenced by his or her beliefs about therapy, personal control, responsibility, and other issues. Unfortunately, there are several common, but misguided notions that can discourage family members from effectively attending to their own well-being. 2. It’s selfish to try to help myself. This myth portrays healthy concern about your self as something shameful. The word “selfish” is a put down, not an accurate or useful description of taking care of your self. It implies that concern about your own well-being is inconsiderate, that it is somehow harmful to someone else. On the contrary, taking care of your self usually helps others (see myth #3 for more on this). 3. Getting help for me will jeopardize my efforts to help her. This myth incorrectly suggests that helping yourself will make you less able to help him. In fact, quite the opposite is true. When you are less burdened by frustration, guilt, and other negative emotions, you will actually be more effective in dealing with other people, including her. Can you honestly say that how you interact with her in your current state of mind is always level-headed and constructive? For more information, the authors can be contacted at Saint Louis Behavioral Medicine Institute, 1129 Macklind Avenue, St. Louis, MO 63110 (314-534-0200 or info@slbmi.com). 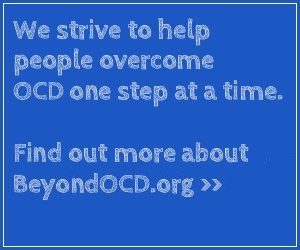 This article originally appeared in the OCD Newsletter and appears with permission of the authors.